The Consulate of Mexico grants $28,812 dollars to be used in scholarships for the education of Mexican students to be distributed amongst three influential educational institutions in Colorado. On December 7th of 2017, the Consul General of Mexico, Berenice Rendón Talavera, signed a Memorandum of Understanding in partnership with Aurora Community College Foundation, Emily Griffith Foundation, and the University of Northern Colorado, for the allocation of $28,812 dollars that will be used as part of the IME Becas scholarship in the education of students of Mexican origin. In addition to Consul General Rendón, the other participants involved in the signing of the Memorandum of Understanding were: Alby Segall, President of the Emily Griffith Foundation; John Wolfkill, Executive Director for Community College of Aurora Foundation, and Cira Mathis, Associate Director of Sponsored Programs for the University of Northern Colorado. Consul General of Mexico, Berenice Rendón Talavera, signs a Memorandum of Understanding with Emily Griffith Foundation President, Alby Segall, at her left. 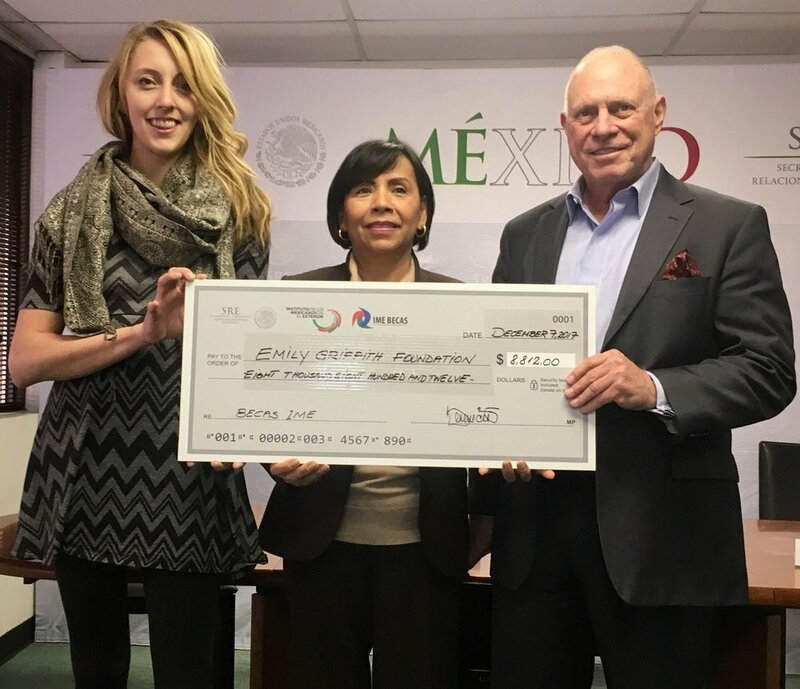 Emily Griffith Foundation's Development Officer, Serena Vandenberg (left), and President, Alby Segall, receive a check for scholarships from the Consul General of Mexico, Berenice Rendón Talavera (center). Furthermore, each of the recipient institutions will match and in some cases surpass the amount of the original grant awarded by IME Becas, bringing the total contribution of grants to $77,624 dollars. These grants will be used to the discretion of the recipient institution, with the requirement that the entire amount awarded be made available as scholarships for its students who have met the criteria. The initiatives taken by the creation of IME Becas and the collaboration of the institutions involved in the partnership expands the horizons of Mexican migrants and those of Mexican origin by providing them with the opportunity to invest in their education, as well as contribute to their empowerment, integration, and development in the United States. The Consulate General of Mexico in Denver has set an agenda consisting with a wide range of programs and events that aim to foster and grow the relationship between Colorado and Mexico through the collaboration with its partners while maintaining the closeness with its community. The Consulate General of Mexico is located at 5350 Leetsdale Drive, Denver, CO, 80246. For more information please call (303) 331-1110.